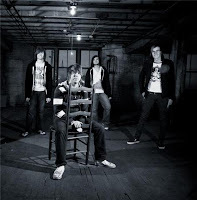 Callahan are a pop-rock group hailing from Springfield, Ohio. Since being together, they have released 2 EP's 'The Calm Before the Storm' and 'Face The Day', which was recently followed up by a new full-length, 'Summer Sampler'. ATP: Introduce yourselves and tell us who you are and your role in Callahan? I'm Jake and I play bass. Brad plays guitar, Wes plays the drums, and Ryan Sings and plays guitar. ATP: What is the history of Callahan? I understand Jake, Wes and Brad are lifelong friends. Jake: Yeah the comers and I were close friends and wanted to start a band together because our old bands were getting stale. It just so happened that Ryans old band broke up so we teamed up with him and started Callahan. ATP: What genre or genre's of music does Callahan cover? ATP: What bands or singers did you all listen to when growing up? J: Wes, Brad, and myself listened to a lot of Metallica while Ryan listened to a lot of country music. ATP: You recently released your a new album, 'Summer Sampler'. What can fans expect from the record? J: They can expect a more mature sound, but it is definitely Callahan. ATP: How has the reaction been so far? J: I think as a whole people have really grown a liking to it. ATP: Like a lot of bands you tour relentlessly. What can people expect from a Callahan show? J: High energy. We all agree that a band is only as good as their live show so we try our hardest to give the fans their moneys worth. ATP: What does the future hold for you guys? J: We plan on touring a lot more and continue to write new material and hope the right people hear it. ATP: Would you like to say anything else? J: A big thanks to all of our fans and supporters. We love you all. 'Summer Sampler' by Callahan is available now.